When faced with the challenge of baking anything (and I mean anything) as long as it contains crème patissiere and summer fruits, what would you do? Make list after list of every summer fruit you can think of (yes, lychees included)? Doodle tart shapes on your chemistry notes and attempt to disguise them as atomic structures when your teacher notices? Drive yourself mad making 8 different flavours of crème pat’ and find they’re all ok…ish? Feel like a pro when you produce PowerPoint mood boards? Yeah, welcome to my world. Having made it through to the semi-final of the Cambridge Bake-off this was exactly the challenge I faced. After days of going back and forth I went back to basics. Going back to basics is always a good call. Try it sometime. 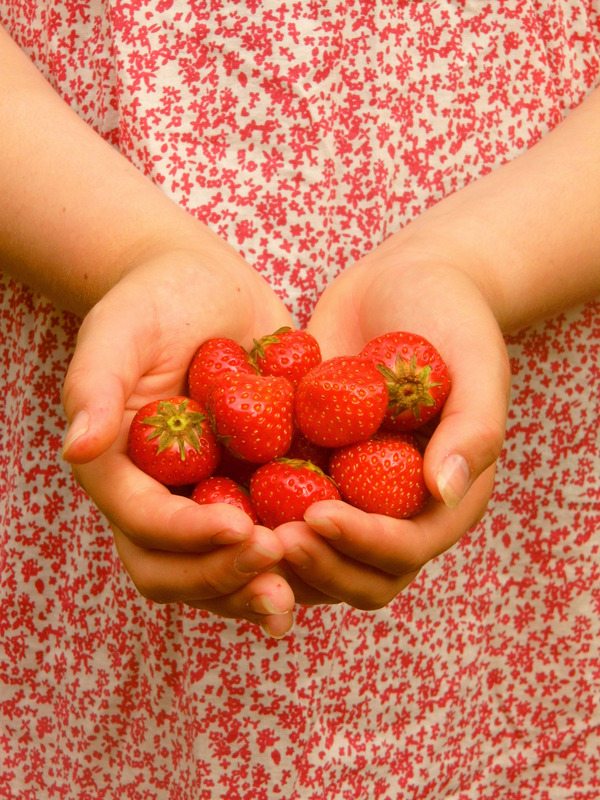 What shouts ‘summer fruit’ more than strawberries? It isn’t summer in my house until the first home-grown strawberries have been eaten. But instead of going down the classic clichéd strawberry tart/cake/meringue route I really did go back to basics. I’m talking about the soily, leafy, still in the ground kinda basics. Go with it, this will make sense in a minute. Crushed Oreos look surprisingly like soil. Fact. 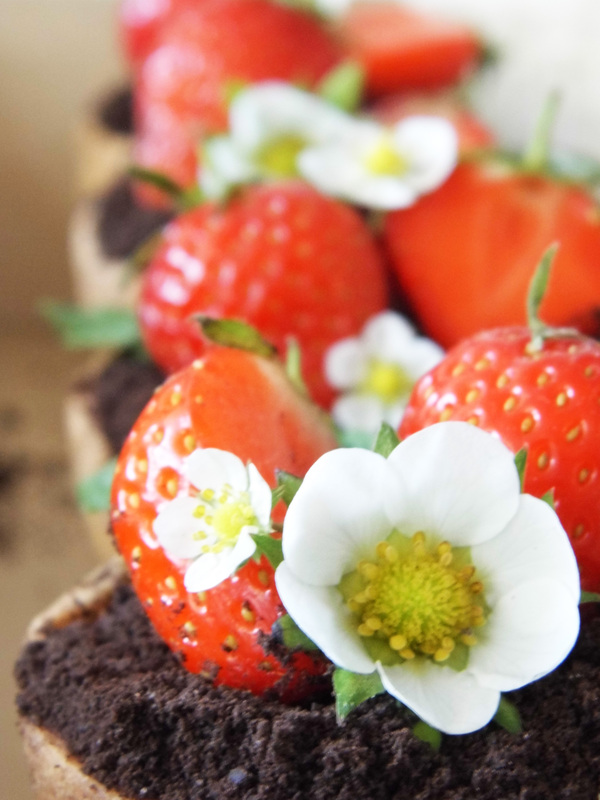 Strawberry flowers are super pretty AND you can eat them. It baffles me why they don’t get the attention they deserve. I guess life’s not fair. 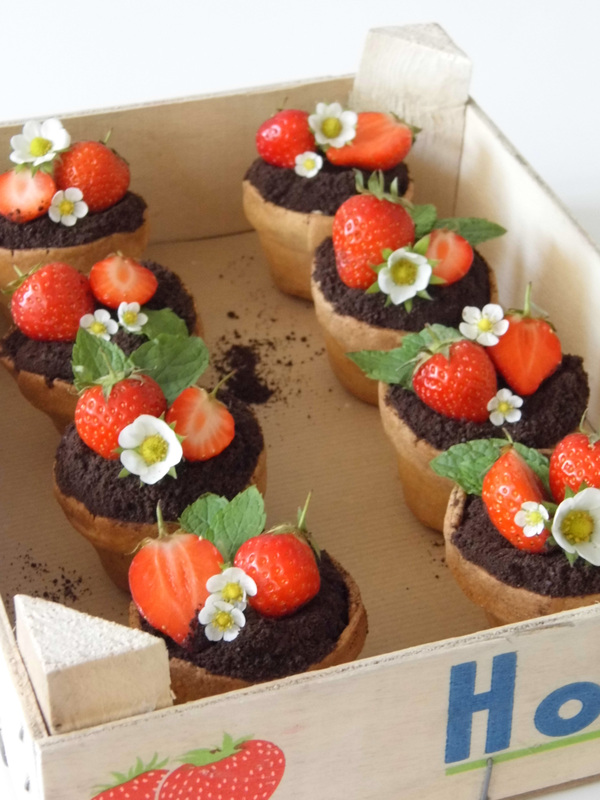 Mini terracotta plant pots make brilliant tart tins. Cooking in terracotta’s cool. It’s like the most basic of basic: Caveman style basic. 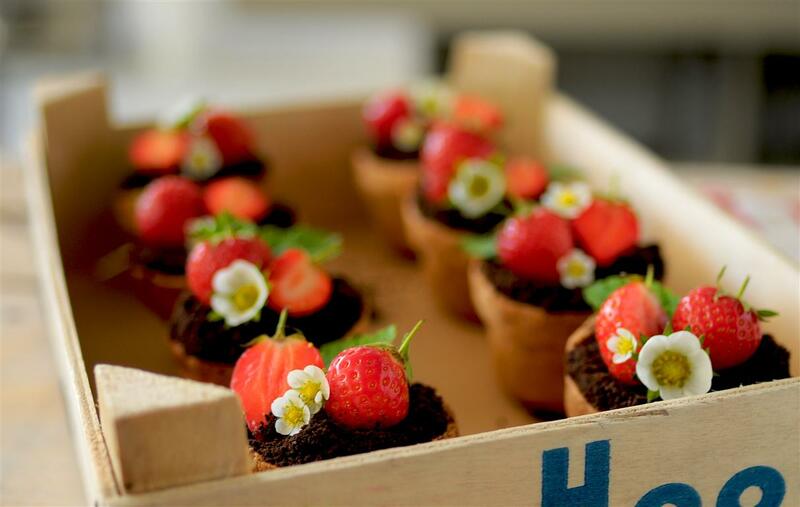 Pastry plant pots filled with strawberry compote and chocolate crème pat’, sprinkled with Oreos and topped with strawberries, flowers and mint leaves became the way forward. 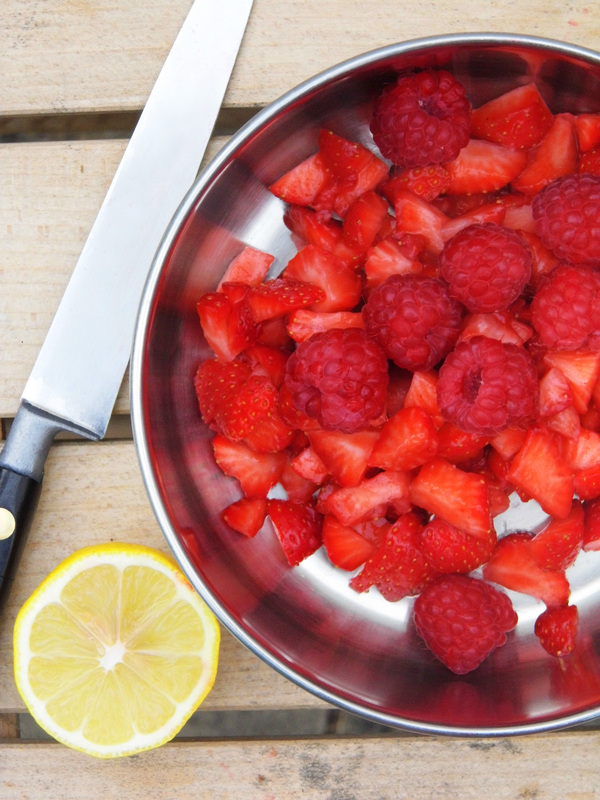 Strawberries made friends with raspberries when they became the compote. Raspberries brought a little tang that helped show the chocolate off in all its glory. Crème pat’ has this scary hype around it. Don’t be scared. Take it on with all you’ve got. You’ll soon find it’s really not that creamy demon you first thought. Just whisk it like a chocolate biscuit. Ok, too far, sorry. Cover the outside of your plant pots with tin foil. Do not press the tin foil too tightly around the pots or it will stick when you try to get your cooked pastry out. Rub the flour and icing sugar into the butter until they resemble fine breadcrumbs with no large lumps. Using a blunt knife, stir in the egg yolk and ¾ of the water until it comes together as a dough, being careful not to over work it. Add the extra water if required. Cover the pastry in cling film and leave to rest in the fridge for at least an hour. If you want to do this part ahead of time it will last in the fridge for up to a week. Cut all the strawberries into roughly 1cm2 pieces and place ¾ of them in a medium saucepan with the raspberries and heat until they start to produce juice. Then add the lemon juice and brown sugar and cook down for about 5 minutes until the fruit is soft and jammy. Stir in the vanilla and then add the water and cornflour mixture and stir until no cornflour is visible. Boil for a few minutes to rid the compote of its floury taste. Stir in the left over ¼ of uncooked strawberry pieces and pour into a bowl to cool. And now it’s crème pat’ time. Oh yeah. In a small bowl whisk together the egg yolks, flour, cocoa powder, sugar, vanilla and cornflour until the mixture is really smooth. Melt the chocolate in a heatproof bowl and put to one side. Pour the milk into a saucepan and heat until steamy. Don’t boil it. Mix the melted chocolate into the warm milk and take off the heat. Pour ½ of the warm chocolate milk into the egg and flour mixture and whisk continuously until smooth. Return the egg and chocolate mixture to the rest of the milk and place back on the heat. Whisk the mixture continuously until it becomes really thick and custard like. Pour into a bowl and cover the top with cling film, pressing it onto the crème pat’s surface to avoid it forming a skin. Preheat your oven to Gas mark 4/180°. Take your pastry out of the fridge and roll out to about ½ cm thick. 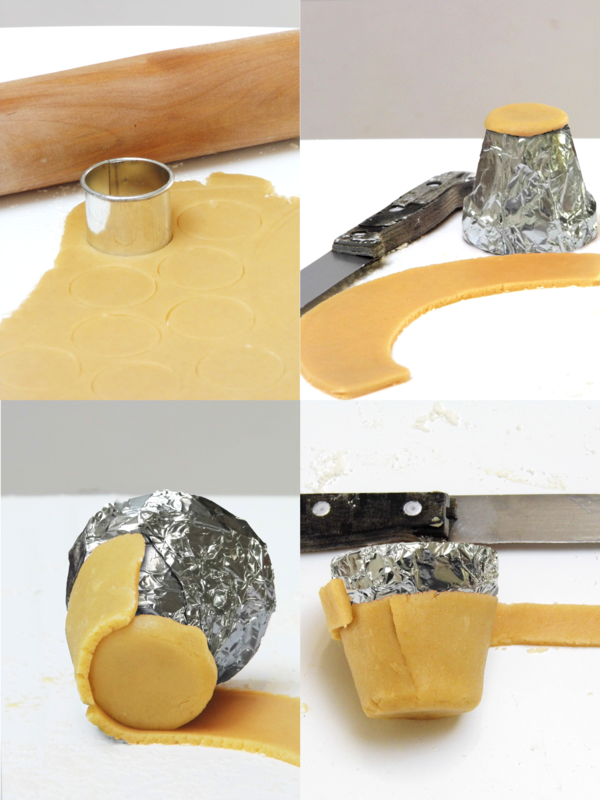 Using a small round cookie cutter (the size of your pot’s base) cut out 10 circles of pastry. Press these onto the base of each of the pots. Use a sharp knife to cut a strip long enough to fit around the outside of your pots and wide enough to reach ¾ of the height. Roll your pot along the strip, attaching the edge to the base as you go. Cut another strip to act as your pot’s lip, egg washing the edge and similarly rolling the pot along, attaching to the pot as you go. Place your pastry-covered pots on a tray, base up, and bake in the oven for 20 minutes or until golden. Remove from the oven and cool completely on a baking tray. Remove pots from their pastry case by unwrapping the foil and twisting the pots gently. Melt the chocolate left for coating and brush the inside of each pot to ¾ of the way up. Leave to set and then half fill each pot with strawberry compote, before topping with chocolate crème pat’ to within 5mm of the top lip of the pot. Sprinkle the surface with crushed Oreos and decorate with strawberries, strawberry flowers and mint leaves to your heart’s content. Many thanks to Ashley from Groover Photography, https://www.facebook.com/GrooverPhotography?fref=ts for the use of the title photograph taken at the Cambridge Bake-off. very very clever! no wonder you did so well in the Bake-off. Any thoughts on an autumn option for those of us who are too late to do this with summer fruits? I’m so glad you like them! I’d love to try out a blackberry and apple compote and top them with blackberries for Autumn. Blackberries’ flavour work surprising well with chocolate so it could be a great combination. Ha, these are an amazing creation!! 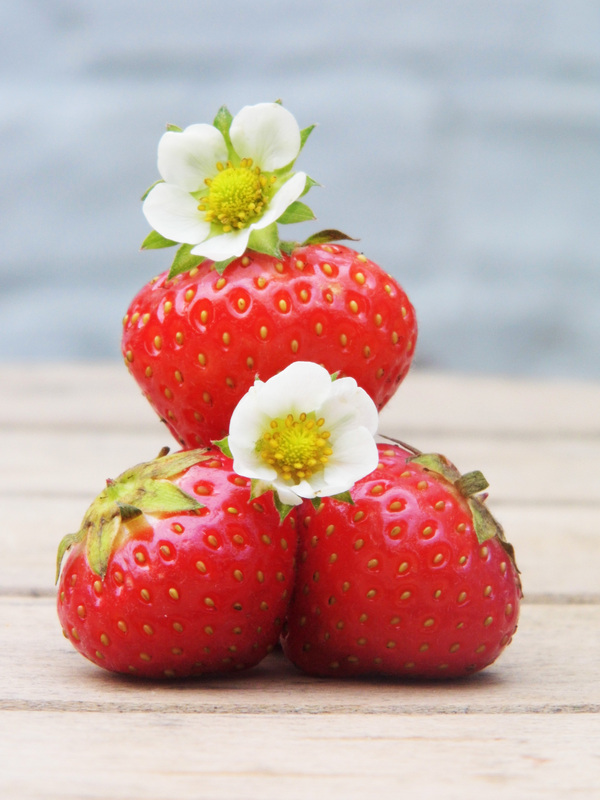 I had no idea you could eat strawb flowers! Would luuuuv to try these, but am just a tincy bit intimidated by the cream pat – may have mustered the courage by june? !